These energetic electrons strike the target, which is a pure metal such as copper or molybdenum, and re move inner (K) shell electrons. When this happens, other electrons from higher level shells drop into the vacant K-shell and in so doing emit a photon (X-ray) whose wavelength (energy) is characteristic of the metal target material. In order to remove the inner shell electron, the incoming electron must have an en ergy greater than the difference in energy between the inner (K) shell electron and a free electron in the con duction band of the target metal. This energy differ ence is referred to as the absorption edge energy. The various energy levels of electrons in the target metal atoms are illustrated in Figure 5.2. The energies of the photons can be computed form the wavelengths by e = h nu = hc/lambda where h is Planck's constant (6.6 x 10-34 joule-sec) c is the speed of light (3 x 108 m/sec), and Lambda is the wavelength (typically in Ångstroms, 1Å = 10-10 m). Fig 5.3. 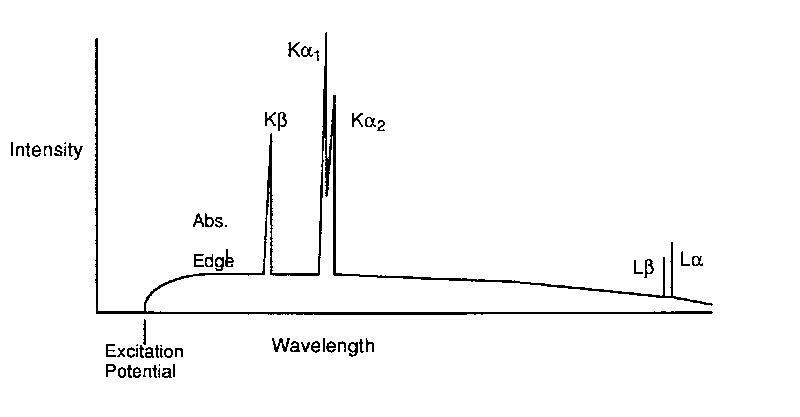 A typical spectrum of emitted X-rays from an X-ray tube is illustrated in Figure 5.3 in which intensity is plotted versus wavelength. Table 5.1 X-ray wavelengths (A) for some typical X-ray target materials. In X-ray diffraction, we utilize the elastic scattering of X-rays by the electrons of the atoms in a crystal. Elastic scattering is scattering in which the wavelength of the X-ray does not change, only the direction changes. Because a crystal is a periodic array of atoms with a repeat distance on the order of a few Ångstroms, it acts like a diffraction grating for photons of approximately the same wavelength as the repeat distance. As mentioned at the beginning of the section on crystal chemistry, crystals are capable of scattering X-rays in coherent patterns because X-rays have a wavelength which is within one order of magnitude of the lattice spacing. This also is true of other types of radiation (e.g. electrons and neutrons). Figure 5.4. X-ray diffraction geometry. The path-length difference between rays scattered from adjacent lattice planes must be an integral number of wave-lengths. This is known as the Bragg Equation and is used to compute the scattering angle, theta, for a given lattice spacing, d, and X-ray wavelength lambda. The plane in the adjacent drawing has Weiss Parameters 1, 3, 2. It therefore has Miller Indices (1/1, 1/3, 1/2) = (6, 2, 3). 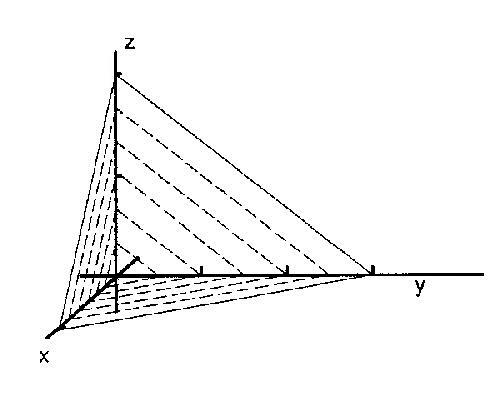 The separation between planes is just the square root of the sum of the squares or the reciprocals of the Weiss Parameters (i.e., the Miller in dices) times the axial lengths. This is the advantage of the Miller Index over the Weiss Parameter. Namely, that it gives the lattice plane separation directly. What is the energy, in joules, of an X-ray photon of Cu k-alpha radiation ( lambda = 1.540 Å)? What frequency is Mo k-alpha radiation ( lambda= 0.70926 Å)? 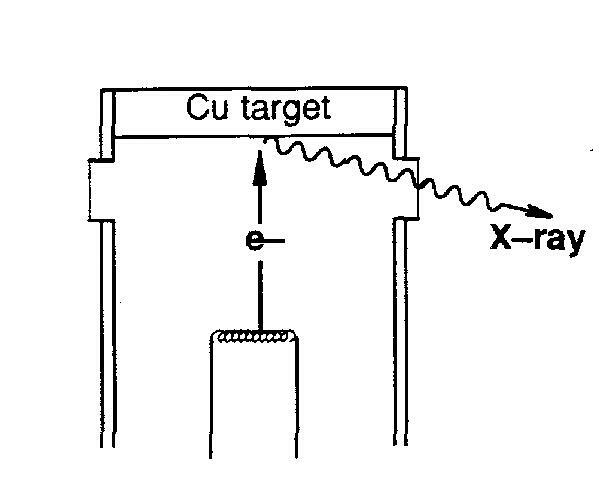 The absorption edge of Cu k-series radiation is 1.380 Å. What is the minimum KV setting on the X-ray generator required to produce Cu k-series radiation? The relative intensities of the diffraction peaks from a single mineral is actually a function of the location of each atom in the unit cell and its number of electrons and the diffraction angle. It is also possible to use the diffracted intensities to determine the structure of hte mineral, although this is not at all straighforward. Normally crystal structures are determined from intensities of x-rays scattered from small single crystals (Typically 0.1mm across). However, some minerals such as clays and some zeolites do not occur in crystals of sufficient size for diffraction experiments, so powder data must be used. The method of fitting, or calculating, every observed point (not just the peaks) in a powder diffraction pattern from atom position, unit cell, symmetry, and peak shape information and refining these parameters to best fit the observed data is known as Rietveld analysis. 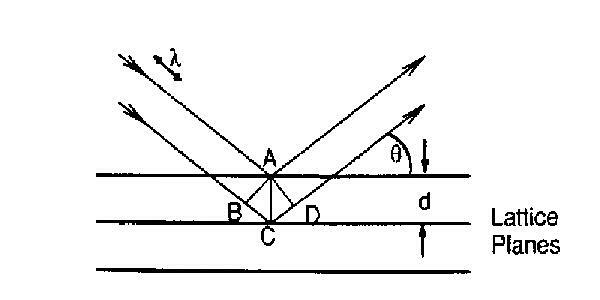 The powder method assumes that all orientations are present in the sample, so that regardless of the angle of incidence, there will be a grain in the proper orientation for each reflection (diffraction). The patterns are very useful for identification of unknowns. There are compiled indexes of powder diffraction data for minerals, as well as inorganic compounds and organic compounds. If the Miller indices of the diffraction peaks are known, it is possible to determine the unit cell parameters of the material from the peak positions. Cell parameters can then be used to determine composition if the cell variation with composition is known. If more than one mineral is present in the sample it is possible, although not easy, to determine the relative proportions of the minerals. To do this one must have a standard pattern for each pure mineral to obtain the realtive internities of the peaks form each mineral. It is then possible to use the relative intensities of non-overlapping peaks to give an estimate of the mineral proportions, called a mode". Bish, D.L., and J.E. 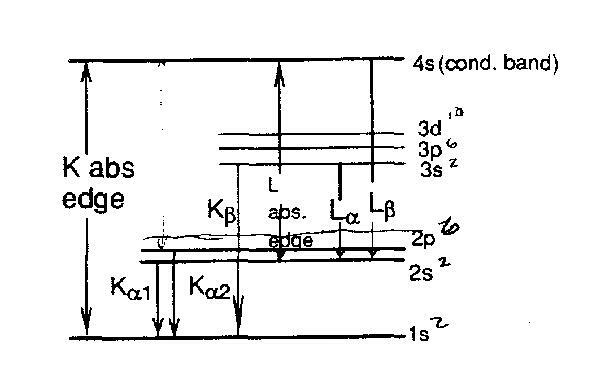 Post (1989) Modern Powder Diffraction. Reviews in Mineralogy 20, 370 pp. 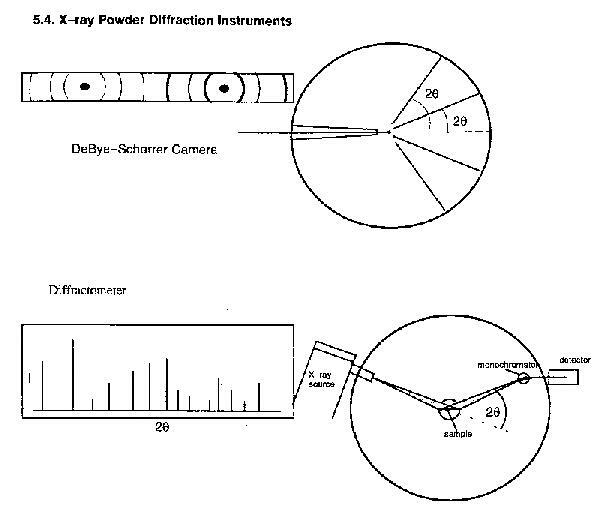 Azaroff, L (1968) The Powder Method, Wiley.